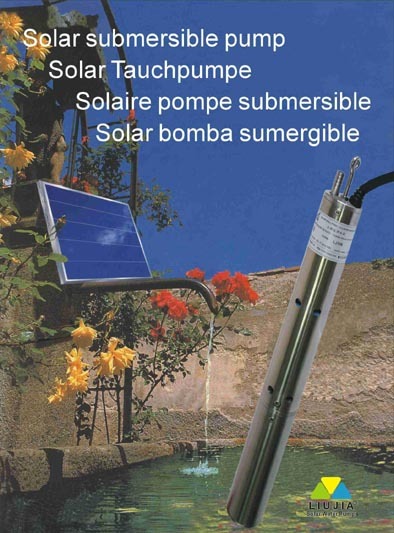 The LIUJIA Solar pump has proven its reliability and usability since 1998 in over 30 countries. Made of stainless steel and without rotary motor, it is built for everyday usage in variable conditions. Only little solar energy, e.g. because of hazy weather, is sufficient to keep the pump working. It can act as a heart for different application systems. The rising demand for energy and water, caused by rapid globalization and economic progress, are leading to unforeseen environmental challenges in urban and rural areas. The LIUJIA Solar pump is unique as it is the only pump in the solar industry to offer an innovative way to allow energy and water saving and decentralized application possibilities. Furthermore it improves the living standards in remote areas through e.g. new watering methods for green landscaping or emergency aid in crisis situations. Floods and earthquakes in particular impact the quality of water, but through installation of a pump it is possible to deliver clean drinking water to smaller households. Any system can be enlarged through connecting multiple pumps to cover larger areas or multiple households. Note: Widespread application possibilities, safe and easy installation and maintenance are advantages of the LIUJIA Solar pump over any conventional pump. According to the operating instructions, the end-user can simply install or reinstall the pump at a new location and maintenance the pump himself. But some functionalities of the LIUJIA Solar pump are also different from most conventional pumps. To guarantee a successful installation and long-term usability, it is very important to follow the enclosed instructions carefully at the first time of usage. - Works efficiently even with hazy weather. The stronger the sunlight, the more water will be delivered. Note: This solar pump is not a substitution for a conventional pump, because it mainly enables new application possibilities as it is an innovative product. Therefore it is critical to investigate the suitability of this product for one’s case and if necessary adapt one's water consumption when using solar energy. Watering of flower and plant beds Watering plant beds at places without water or electrical supply can be supported through the LIUJIA solar drip system. it is possible to water flower and plant beds in a cost effective way. Greening up decorative rocks in garden pond LIUJIA Solar pump LJ1012 is the ideal choice in this case. The designer can install a solar module more than 10 meters away in a hidden location. The pump can be hanged into the pond. Solar micro irrigation Considering the small amount of delivered water, the Liujia solar pump are the ideal choice for irrigation a small family's garden or small area. Water supply for animals A widely used application of the LIUJIA Solar pump is creating watering places for animals. Through this application it is not necessary anymore to lead them time-consuming to a river or a lake. Small showers in beach The tourism branch uses a lot of water. After swimming in lake or sea, which contain salt, algae or another minerals, the possibility to take a shower improves the swimming quality in the area. Water suplly for domestic usage Small towns sometimes suffer water shortage in summer. Trucks have to regularly refill water tanks, which are installed under houses or gardens. Another option is to build underground cisterns to collect rainwater.